London-based young Franco-Belgian Aglaé Bassens’ recent shows have, you might say, made something out of nothing, gracefully uncovering the atmospheric melancholy in empty fish tanks, viewless windows, curtains and sofas. At CABIN, though, such reifications of emptiness are outnumbered by a new stream which, you might say, makes nothing out of something. We are pretty-much defined by our bodies and our heads, but Bassens presents only partial views of them: claustrophobic, awkward, intimate perhaps, but also shuttling those subjects back towards emptiness. Other painters have made this move, but have tended to use a hyperreal technique of objective scrutiny. Ellen Altfest provides a good example: every follicle and wisp is painstakingly captured in her tightly-cropped sections of hirsute male flesh. Bassens, in contrast, carries on with her distinctively fluid, rapid, intuitive application of paint, which points to colour field abstraction rather than photorealism. How, she was asked recently at her extensive show at the Revue Gallery, do you create the impression of painting with single strokes? ‘I paint with single strokes’, she replied. Yet the results, like Altfest’s, oscillate between desire and detachment. After all, when do you really pay attention to how hair is parted other than when homing in on the minutiae of a loved one? Surely that peep-through of ear is waiting to be nibbled? And when do you look closely at how a shirt buttons up, other than when you intend to unbutton it? The more so, perhaps, in a fresh infatuation, in which context the third subject of Bassens’ paintings at Cabin – the curtained window – may signal the potential for pulling aside any obstructions to new experience. As Bassens says, ‘the title ‘Front Parting’ suggests an element of sensuality to these new works, or at least of self/other and male/female’. There is also a literal aspect. We see a front-parted hairstyle in Forehead, one of the apparently female extracts here. And where is a shirt, which reads naturally as male here, parted other than at the front? And a curtain too, come to that? Yet a certain plangency remains in play, for parting also evokes loss. A curtain, after all, can be an exercise in frustration as well as temptation. Now that I think of it, that’s the other context for the partial view: glimpses of what you’d like to be closer to, are keen to experience whole, and yet cannot. ‘We passed on the stairs, and the way she parted her hair haunts me still…’. There are other ways, separate from the seemingly casual handling of paint, in which Bassens’ work departs from realist models. The framing and staging of the image tends to call attention to the choices being made and presented to us. 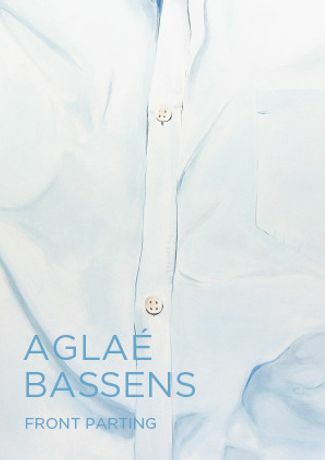 Indeed, Bassens has sometimes included the process of painting in the painting. That staging extends to the scale, especially if what seems insignificant is blown up as big as Big Shirt Painting (there’s a twist of humour there, too: what’s big, the shirt or the painting?). Moreover, to monumentalise the partial view is to make it an explicit strategy, not a playful failure to fit the whole in. ‘I was interested’, she says, ‘in being so close to something you cannot see it’, in a phrase which retains a mournful undertow, as it might equally apply to the failure to remain objective or to the flaws in a relationship revealed only by a traumatic event. Bassens also has one eye on the history of art. The window can stand for plenty in that, and there’s a long history of white abstraction – it’s enough of a cliché that Yasmina Reza’s play Art revolves around it. The shirt and curtain paintings nod to that modern trope, though what the shirts remind me of more are snowscapes. Those blues have crept in from Monet and Pissarro. Then the ear in Ear plays the role of Fontana’s slash in the canvas. This is the point at which we could hurtle on all the way to Freud. But actually I don’t believe it’s there in the work. That’s just the sort of interpretation Susan Sontag was against, one which imposes a metaphorical straightjacket on what the artist really means. There is a sensual tug here, but it’s placed in a setting which holds our engagement in check. Such art is reflective, rather than directly empathetic, and reflective art, said Sontag, though it ‘should not be frigid’, should be set up such that ‘the pull towards emotional involvement is counterbalanced by elements in the work that promote distance, disinterestedness, impartiality. Emotional involvement is always, to a greater or lesser degree, postponed’. [i] Sontag spoke of ‘the erotics of art’, implying that we should approach it through sensuous engagement with form rather than seek a metaphorical interpretation of what it means. She wanted ‘transparence’, which she glossed as ‘experiencing the luminousness of the thing in itself, of things being what they are’. [ii] Circling back to how Bassens hooks us in to the world by applying a fluent painterliness to unexpected subjects, ‘transparence’ may be the word which catches how she makes something out of painting what seems nothing, and why she doesn’t quite make nothing out of painting something. Sontag, I reckon, would look at this show and ask: ‘see what I mean?’.